Anandtech has an exlcusive benchmark on INTEL's Yonah dual core notebook chip against AMD's Athlon 64 X2 3800+. The Yonah is 2GHZ with 2MB cache made on a 65nm process, the Athlon 64 x2 3800+ is 2GHZ with 1MB cache (2 x 512KB). As you can see, despite having twice the cache, the 65nm Yonah CPU is slower than Athlon X2 3800+ at the same frequency in most of the tests, sometimes significantly so. For example, Yonah 2GHZ is 20% slower than Athlon 64 X2 3800+ in video encoding tests. In all, the score is 16 to 6, the x2 3800+ won 16 tests, and the Yonah won 6 tests. This is not surprising, in a comparison of INTEL Dothan 760 (2GHZ, 2MB cache) and AMD Turion ML 37 (2GHZ, 1MB cache) done by laptoplogic, the Turion won 15 tests, the Dothan won 7 tests. From this, one can conclude INTEL's Dothan and Yonah CPU cores are lower than Athlon 64 core on 32 bit IPC (Instructions Per Clock). Furthermore, Yonah is a 32 bit chip based on the old Pentium III. In June 2005, Mooly Eden, an INTEL VP claimed that enterprise demand for 64 bit is low. INTEL "made a conscious decision" to not add 64 bit to Yonah to achieve reasonable battery life. Eden claimed that "It may take many years for enterprises to demand it (64 bit)". As a result, INTEL's Sossaman CPU, which is adopted from Yonah for servers, will also be a 32 bit chip. 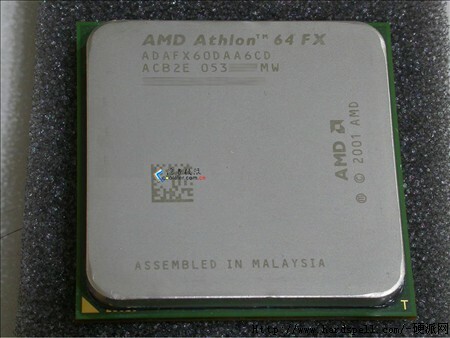 The Athlon 64 x2 is a 64 bit chip by design and can run future operating systems such as Windows Vista, which is a 64 bit OS to be released in 2006. The Athlon 64 X2 gets a 30% performance boost under a 64 bit OS. AnandTech also compared the power consumption of two systems under max load. The Athlon 64 X2 3800+ desktop consumes 144 watts, the Yonah consumes 108 watts. The Athlon 64 X2 consumes 36 watts more. According to AMD, the Athlon 64 x2 3800+ is a 89 watt chip, therefore, the Yonah is at least 89- 36 = 53 watts*, which is basically the power consumption of two Dothan cores. This indicates that INTEL gets no power reduction by going from 90nm to 65nm. A very bad sign, because INTEL's speed will be again limited by heat. In comparison, the popular AMD Opteron 870HE, a 8 way 64 bit server processor at 2GHZ is 55 watts. From AMD's persentation, with DSLSSOI, AMD's 65nm is much lower on power. We can safely assume that the ASUS A8N SLI desktop MB consumes more power than the Yonah Notebook motherboard. Google is late on everything, late and search, late on email, I don't see anything google is doing that has not been done by others before. But Google's success tell us it doesn't matter if you are late, as long as you are much better. This is especially true with internet, where good things are just a click away. The playing field is level on the internet, if you are fast and if you are good, people come, no barrier of entry there --but you have to be able to handle the volume. Google's search engine is faster, more accurate and more powerful. For that, Google poured in years of research on operating system, software and hardware. And google is doing something bigger. According to this PBS report by Robert X. Cringeley, google is putting 5000 Opteron CPUs and 3 peta bytes of storage into enclosures the size of a shipping container. Google can haul this monster to anywhere there are power supply and fiber, turn on the switch and you get a copy of google right there where you need it. The plan is to have 300 such beasts around US. That will be 1.5 million AMD Opterons and 900 peta bytes.... No wonder people are saying Google will become an infrastructure company. Yahoo better hurry up and do something. I noticed that visiting Yahoo is getting slower and slower. "INTEL has been very competitive in terms of pricing with us". "INTEL is catching back up, may be it will take a little bit more time." "We maybe less profitable, certainly in the near term, if we had moved over"(to AMD). AMD has taken 38.2% of the 4 way server market in Q3 2005. Why would DELL be less profitable if goes AMD? INTEL will cut off bonuses. At this point, AMD simply does not have money to lure DELL away from INTEL's gold pile, according to Paul Otellini, keepng DELL happy is INTEL's most important job, INTEL got 14 billions, AMD has only 1 billion. Even if AMD gave all its cash to DELL, it is not enough to keep DELL afloat. So AMD must give up any wishful thinking that DELL will use AMD in the near term. I expect AMD to win the lawsuit against INTEL and get a big pile of money out of that, maybe AMD can use the money to entice DELL then. HP uses AMD and is doing very well because HP has deep pockets, somewhere around 40 billion of assets to do its own R&D. In comparsion, DELL has only 5 billon of assets. DELL's cash position is less than its bills to pay. So DELL is lving on the fringe, it can't survive if INTEL support is suddenly cutoff. AMD's plan is therefore based on the assumption that it does not do business with DELL and let DELL sucking more life blood from INTEL, making INTEL and DELL more dependent of each other. Such a INTEL+DELL relationship will alienate other INTEL customers and make more willing to do business with AMD instead. Remember, DELL has only 16% of the world's PC market, and there is the 84% for AMD to capture. 1) Lower the price of Opteron for SUN to allow it to grab more DELL share, so there will be two major guys HP and SUN ganging up on the DELL dude. 2) DELL will suffer more losses and demand more price cuts from INTEL. INTEL will have to sell chips at even lower prices to DELL, creating a bigger price differential between DELL and HP's INTEL CPU costs, thus making HP more inclined to promote AMD in all segments, as it can't compete against DELL in the INTEL market. 3) The cycle continues, until at one point, HP will find it much more profitable by going 100% AMD. 4) The result is AMD,HP, SUN take the high end x86_64 market and INTEL, DELL take the low end. Of course, AMD must maintain a 30% performance lead over INTEL. Judging from the overclockability of AMD chips, AMD has a lot of room. AMD's Spansion Memory Group subsidiary has posted 4 straight quarters of loss. The unit is being IPOed. On November 28, 2005, AMD filed Form 8-K/A, Item 7.01. Regulation FD Disclosure, in which it stated despite improving gross margins and increased utilization :"the Company expects the Memory Products Group to incur an operating loss in the fourth quarter of fiscal 2005". Associated Press (AP) jumped on the news and wrote: "Advanced Micro Devices Inc., down 91 cents to close at $25.58. Losses are increasing for the chip maker's flash-memory unit ahead of the unit's initial public offering, the company said in a filing with the Securities and Exchange Commission." Then other media twisted it even more. It's fortunate that Spansion will post a loss after all, no one expected it to post a profit. If it made profit and then goes IPO, the Wall Street crooks will all say AMD lost the profit engine and will fall hard. 7 rounds of desktop tests, INTEL's best result is 4th place. CNET was correct to give AMD a score of 100, and INTEL a score of 0. Lawyers, the lawsuit is working and the people are no longer afraid of telling the truth. Keep on the pressure on INTEL, break the axis of evil and free the world! I hope the media folks take a note of this and acknowledge INTEL as the tech underdog in your unbiased writings. What we see here is utter and complete destruction, or Annihilation as INQ pointed out. INTEL is totally destroyed and demolished on technical and economical merits. The best INTEL can do there is to achieve 65% of AMD. AMD has taken 38.2% of the 4 way server market in Q3 2005. Currently, AMD's 4 way dual core server ( 4 Opteron 880) is about 40% faster than INTEL's 4 way dual core servers (4 Xeon MP 7040) in integer performance, and 200% faster in floating point performance (AMD 3x of INTEL). HP DL585, I choose the Opteron 875 CPU, because with 4 Opteron 875s, the Dl585 has a SpecInt_rate score of 128, which is still 21.9% faster than 4 Xeon MP 7040 score of 105 in integer performance. So, by going with AMD, you pay $6133 less, and get 21.9% better integer performance and over 60% better floating point performance. In other words, HP (AMD) has a 57% price/peformance advantage over DELL(INTEL) when you consider integer performance. In floating point, AMD advantage is off the chart. Now, consider the power consumption, the DELL box consumes 600 watts more, assuming $0.18/kwh for electricity, that is 600*24*365*0.18/1000 = $946 /year more. Considering the HVAC expense to keep this much heat out and the damaging effects to components such as capacitors and HDDs due to long term continuous exposure to 1470 watts of heat...you get the picture. Updated: INQ suggests that DELL lovers should ask for 50% discount on DELL servers based on price/performance. It's your money. It's Thanksgiving time, in Thanksgiving spirit, HP and Wal-Mart offered an AMD64 powered notebook at $378. The spec for the machine was impressive, 64 bit CPU, 40GB HDD, 802.11g/b, 15inch LCD, 256MB ram. CNN reported fights broke out in Florida when a man tried to cut in line to grab the notebook. CBNC showed a video of a stampede at the Grand Rapids, MI Walmart store at opening. People lined up at WalMart doors since 2:00am in the morning then dushed into the stores like a flock of migrating wildebeest. The demand for AMD64 technology is high and AMD surpassed INTEL in total desktop and notebook units in US retail stores. When people can see the computer, they choose AMD64, and they even literally fight for it. DELL has a sell too, a 32 bit INTEL notebook for $399 plus shipping. Too bad, INTEL is stuck at 32 bit for another year. When was the last time you saw people engaged in brawls for 32 bit INTEL technology? HP may pull off another such sale during Christmas season. When people know they can buy quality 64 bit notebooks from HP for $300+, they will stop buying from DELL, even though the quantity of these HP notebooks is limited. I suggest AMD to plan several such sales in a row to achieve maximum effect. Paul: Mike, are you there? Mike: Yes, how may I help you? Paul: I heard the AMD news from Taiwan, we have gone through this drill many times before, how much do you want? Paul: I know. But remember, we still got the money. Mike: No, it's not the money, we are losing market there in the enterprise market, Wall Street crooks expect us to grow revenue and market forever, it is not just a matter of profits. We are a 80 billion company, we have to show good growth. Paul: I promise you Dempsey is going to kick Opteron's rear. Mike: Sorry, Paul, I got a coneference call in two minutes, can I call you back? Second class CPU maker INTEL made news by annoucing a joint venture with Micron to produce NAND flash memory. There are two types of flash memory, NOR and NAND. Both INTEL and AMD's Spansion are NOR makers. NOR is used to run program code. NAND is used on devices such as Apple's iPod to store data in blocks. Companies like Samsung are big NAND producers. NAND has become increasingly in demand due to the popularity of devices such as iPod. It's not surprising that NAND has vastly surpassed NOR in the number of bits, simply because there are more data than program code. However, it should be noted that NOR has a much higher price per megabit and probably higher profit margin. AMD has announced that Spansion is enjoying a 1.4:1 book/order ratio in Q3 due to increasing demand for its advanced mirror-bit technology. AMD is also the first to develop 90nm NOR flash and is moving to 65nm next year. AMD has a clear lead in NOR flash. So basically, INTEL has become a NAND flash play too. BusinessWeek's Olga Kharif noticed this and wrote an article titled Intel Switches Its Chip Bets. However, as most analysts, she can't draw logically sound conclusions based on the totality of the situation. First, INTEL doing NAND can't lead to any conclusion that INTEL is moving away from NOR. INTEL might have just see NAND as an oppurtunity and grab the chance to diversify itself into NAND. Second, even if INTEL is indeed moving away from NOR, then that is great news for Spansion, which will enjoy more of the NOR market. Third, it is well known that the NOR flash suffered a 40% price drop in Q4 2004 because INTEL initiated a vicious price war to hurt AMD, which caused AMD to lose money in Q4 2004 after many quarters of profitability. In a more healthy competitive envrionment with pricing based on demand, Spansion will do much better. AMD survived the NOR price war and Spansion is ready to prosper on itself through IPO. AMD will continue to lead in server, desktop and mobile CPU markets, while INTEL is trying desperately to play catch up. Craig Barret said: If you are one generation behind you are dead. The following was an email message I sent to Mr. Michael Dell, Paul Ottellini of INTEL and Hector Ruiz at AMD. performance and performance/watt on desktops. AMD had a financial analyst meeting yesterday, it's good stuff. AMD is doing a glueless 32P Opteron in 2007, coupled with quad-core, that will be 128 way computing. Unless a quick solution is found, IBM mainframe is pretty much dead. Right now, Newisys's Horus chip can push Opteron to 32P, and with dual core, you get 64 way. But the Horus chip is not going to be cheap. Glueless 32P sounds like Alpha EV7/EV8 for the masses. Judging from Paxville and Dempsey and AMD's accelaration, INTEL has no hope of catching up by 2012. Also in the news, SUN and AMD signed a deal to sell Japan a huge supercomputer with over 10,000 Opteron cores. It turns out the machine is based on 8 way Galaxy servers, which made the deal much more interesting. SUN is also working on a storage system based on Opteron and SUN's ZFS, now that is really cool. AMD CFO Mr. Rivet projects its operating margin to increase from current level to 18% to 24% in 2006. Surprisingly, SG Cowen's Jack Romaine claims he knows better, and alleges that AMD's operating marging will be 10%, down from 13%. Looking at Jack Romaine's score card on AMD, he got a score of 0 stars on 19 analysis. I wonder why the financial industry keeps this kind of zero accuracy lame analysts on the payroll and shoot air onto places like Forbes. Maybe some of them are on INTEL's or INTEL fund's payroll. A couple of weeks ago, my Windows XP SP2 got infected by this nasty spyware/adware which keeps openning new browser windows of ads. It is so annoying that I had to stop it and the struggle continued for 3 weeks. I first run McAfee virus scan, it can catch a lot of spyware and other PUPs (Potentially unwanted programs). I updated McAfee, tried to run it, but in the middle of the run, the machine automatically reboots itself. The Spyware knows how to protect itself? I then uninstalled McAfee and installed the newest version of Symantec Norton Anit-Virus freshly downloaded from their web site. Boot the machine in safe mode, with network disabled, ran overnite, it found and removed some stuff. But the adware persisted. Keeps poping up. I thought the adware is somehow tied to IE, so I switched to FireFox, no help, the thing is so smart, it opens new ad windows even when I browse with FireFox. Maybe FireFox was infected too. So, I downloaded and installed Opera browser, which did not exist on the system. No help. Even when I use Opera, ads pop up after I view a few web pages. This thing is tough. I then downloaded the Adaware Spyware removal tool from LavaSoft. No help. Did the spyware/adware just planted stuff to kill McAfee? I then got rid of McAfee and tried to re-install Symantec's anti-virus. It can't be installed either. I then downloaded Microsoft's AntiSpyware Beta from microsoft.com. I guess Bill Gates was hit by spyware and ordered his army of dummy programmers to hack out something (which scared the s**t off Symantec stock holders at some point). Microsoft AntiSpyware found and removed some stuff. But no help, the bad guy persists. The most brain dead aspect of the Redmond dudes is this: when it found some bugs, and you stopped the scan, it gives you no chance to remove the bugs already found, you have to start all over. With all other scanners, when you stop in the middle of a scan, you can proceed to remove the bugs already found. Maybe the Spyware author is so smart, he wrote code to screw McAfee, Symantec and Microsoft? My PC is an AMD Athlon 64 machine, it also has Windows XP x64 installed as dual boot. So I booted into the 64 bit environment, my plan is to run anti-vrirus and spyware sweepers from there because it's not infected. Disappointing! The Windows x64 has been out for a year and Symantec and McAfee do not support 64 bit! They both balk at the middle of install. Microsoft AntiSpyware and LavaSoft's Adaware can be installed under Windows x64. But after running them on all the hard drives (including the one with Windows XP 32 bit), and booting back to XP 32, the Spyware is still there. It is laughing to my face. I felt so mad! I tried all sorts of things, like deleting suspicious drivers, DLLs, updating Windows, etc, etc. No help. I snooped the TCP/IP traffic and tried to configure the router to block the sites the spyware was trying to visit. No help. I had to work under the Windows x64 environment to avoid the spyware. But, when I needed to use Adobe to create PDF file, I had to go back to 32 bit, because the Adobe PDF Distiller is a printer driver, and 32 bit drivers won't work under 64 bit. I used the System Restore feature to restore XP 32 bit to a date before the infection. No help. I thought about re-installing the Windows XP 32 bit. But that would be a pain. Eventually, I decided that I should try some other anti-spyware products. After trying a few without success, I stumbled on to WebRoot Spy Sweeper. It says it can even detect and stop rootkits. I installed WebRoot Spy Sweeper. I did not reboot. Immediately, the Spy Sweeper stopped the Spyware, it intercepted the spyware's attempt to access a seceret web site, potentially for retrieving new ad URLs. It discovered the Spyware in memory. Now, I ran sweep, alas, over 70 bugs were found, and quickly removed. Microsoft AntiSpyware, Symantec Anit-Virus both run so slow, it takes a whole night to finish, and they fail to catch the bugs. The Spy Sweeper finished scanning 3 disks each with 200GB in just a couple of hours, and it discovered so many bugs. Most importanly, it caught the most annoying bug and killed it right at the spot. The bug is dead, justice and revenge is quick and sweet. It is clear that the WebRoot Spy Sweeper is light years ahead of Microsoft, Symantec, McAfee and LavaSoft in anti-spyware technology. On the interface design, Spy Sweeper is 1000 miles ahead of these big but stupid companies. The most brain dead interface is Microsoft's. The most annoying is Symantec's. The most fragile is McAfee's. WebRoot Spy Sweeper proves one thing: one genius is greater than 100,000 idiots. INTEL has been very shy these days, Paxville was launched over a month, and it's nowhere to be seen, the usual hardware sites such as tomshardware and anandtech have no benchmarks for it. Only GamePC had a benchmark showing dual core Paxville at about 50% of Opteron in Apache benchmarks. Now the rumor is INTEL started sending its Dempsey dual core chips with dual independent bus to reassure its customers, under NDA. Opteron old dog: the 130nm, 3 year old, Opteron 246 single core at 2GHZ. Currently, the AMD's hot selling top dog is the 2.6GHZ dual core 90nm Opteron 885SE used in Sun's Galaxy line. I don't think anyone is expecting the $100 single core Opteron 246 to sweep the floor on the $3000 2007 dual core Dempsey/Bensley, nevertheless, the single core Opteron 246 managed to beat INTEL's future dual core chip on some tests. Sandra 2005 x64 -Memory: Opteron 246, 10400MB/s, INTEL Dempsey 3.4GHZ dual core, 4838 MB/second. Single core Opteron 246 is 200% of dual core Dempsey 3.46GHZ. Sandra 2005 x64 - Cache/Memory @ 64MB: Opteron 246 single core, 5485MB/s; INTEL Dempsey 3.46GHZ dual core, 4430MB/s. Single core Opteron 246 is 25% faster than dual core Dempsey 3.46GHZ. Cinebench 2003 x64: Single core Opteron 246 scored 366, dual core Dempsey 3.46GHZ scored 377, a virtual tie with less than 3% difference. 3DS Max 8.0 Ape: Single core Opteron 246 finished in 126 seconds, Dempsey dual core 3.46GHZ finished in 133.8 seconds, Opteron single core 246 is 5% faster than Dempsey dual core 3.46GHZ. ScienceMark 2.0 FINAL x64 Mol-Dyn: Single core Opteron 246 finished in 26.97 seconds, dual core Dempsey 3.46GHZ finished in 32.97 seconds, Single core Opteron 246 is 20% faster than dual core Dempsey 3.46GHZ. Power consumption: Dempsey system uses 438 watts, the old single core Opteron uses 262 watts. Remember, newer 90nm Opterons made on Dual Stress Linear Strained Silicon on Insulator technology uses even less power. Conclusion: INTEL architecture is hopeless, even an obsolete 2GHZ single core Opteron 246 can beat its 2007 future chip on performance, and INTEL's heat production problem is beyond cure. Update: I found that the Opteron 246 has been discontinued. The current highest AMD CPU is the Opteron 885SE. Developing countries have usually been the dumping ground of second class US high-tech companies such as INTEL. In US retail market, AMD's combined notebook and desktop market share surpassd INTEL in Oct 2005. While in US, more people are aware of the underdog status of INTEL, and choose the advanced AMD technology instead, people in places in China and India still prefer INTEL due to brand recognition. INTEL is keenly aware of this. However, the Chinese are no dummies, they actually test their CPUs and even break them up to see what is really inside. 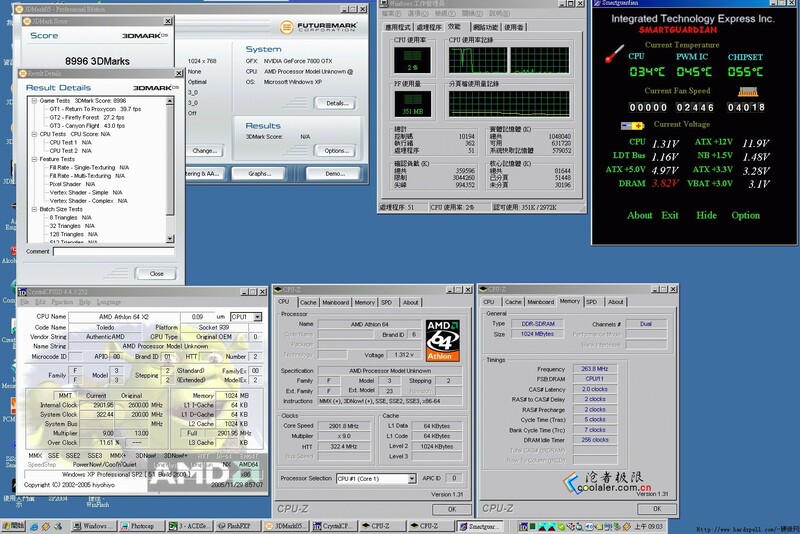 One Chinese man recently ran some tests on his INTEL notebook and found out it could only run at 800MHZ. Then a Chinese IT web site, www.it168.com, disovered there are large quantities of INTEL "counterfeit" mobile CPUs made by INTEL itself. INTEL first denied the existence of such "counterfeit" CPUs, but the review site claimed that the techniques in making these "counterfeit" CPUs are too sophisticated and only INTEL can do it. INTEL later admitted that some ODMs requested such CPUs. For pictures of the CPUs under microscope, look here. A leading Chinese web portal, SOHU.COM dedicated a whole page to this incident, and INTEL is stripped naked under the sun. Chinese take ethics very seriously, expect INTEL to lose big time there. Just a couple of weeks ago, I went to http://www.supermicro.com, and searched Opteron, what I got was a page saying "Sorry, no matches found". We knew SuperMicro started making Opteron motherboards many months before, and it did have a page dedicated to Opteron boards. So, this deliberate exclusion of Opteron for their search engine is, well, suspicious, in light of the stories revealed by AMD's lawsuit against INTEL. Today, following others leads, I went to dell.com, and searched "AMD", near the top, there is a link for "AMD Processors", clicking on it, leads to a list of AMD desktop CPUs...Weird, considering that DELL dudes always insult AMD one way or the other. So I went back to supermicro.com and searched Opteron again, alas, now it happily finds a list of AMD pages. Since INTEL will trail AMD at least until 2009, I guess people are more eager to sell AMD gear now. That ought to be good for the advance of technology. DELL is the Wal-Mart of IT. Wal-Mart sells a lot of stuff assembled in China, so does DELL. DELL is also a seller of other's products, such as Canon cameras and brand TVs. It makes sense for DELL to sell the Athlon 64 CPUs--there is big money to be made by just reselling AMD. I estimate that DELL can make $30 assembling and selling a $399 desktop, but DELL could make $100 by just reselling a FX CPU, easy money. The MIT media lab has been working on project OLPC -- One Laptop Per Child. The laptop costs only $100. AMD's Hector Ruiz has this 50x15 plan to enable 50% of world's population to have internet access by 2015. With the OLPC project, world's poor children will have access to a laptop computer. Some countries have already committed to buy millions for their school children. Surprisingly, the Chilean government came out and say they have no interest on it. "The government's decision to not participate in the US$100 laptop initiative almost certainly has to do with intense lobbying by Microsoft and Intel, companies the [Chilean] government has close ties to, because the laptop would use a Linux operating system and AMD chips," said Delhaes. This is truly disgusting! OLPC is not for profit. Microsoft and INTEL made so much money, and they won't allow children to enjoy a $100 AMD laptop running Linux?? We will have no problem if Bill Gates and Paul Ottellini work together to build a $100 INTEL laptop with Microsoft Windows for every child of the world. Spoiling the OLPC project for the sake of WINTEL's profit and market control is really evil. It is kind of disappointing to note that SUN's production of Galaxy is slow. As far as I can recall, SUN spent over a year to develop the Galaxy, while HP seemed to be able to push out one Opteron models after another. The good news is, Niagra is shipping slightly ahead of schedule. Update: SUN finally delivered 2 X4200 Galaxy servers, the good news is the Galaxy is super fast, these 2 servers replaced 22 INTEL servers; the bad news is, with this kind of performance, customers only need a few Galaxies, so we need to re-evaluate the x86 market size. DELL's balance sheet looks horrible. The balance sheet is just like your bank account balance against your bills. It shows how much money you have and how much you owe. One of the very important items are those that are "current", basically, the amount of cash and the amount of bills that must be paid now. There is a measure called "current ratio", which is the "current assets" divided by "current liability", it's like your money in the bank divided by the total amount of bills. If this number is bigger than 1, you have more money than bills and you are safe. If this number is smaller, you have more bills than money and you are in trouble. If current ratio is one, then your money is the same as bills, and you are living on the fringe. See the problem? Adding up the cash and cash equivalents, you get only $13.45 billion. Almost one billion short of paying the bills. However, there is a mysterious $2.739 billion "other current assets", which keeps DELL away from insolvency. If I were a DELL investor, I would be very interested in knowing what this $2.739 billion other current assets are. I predicted that DELL will be the next Enron. IBM spent $1.827 million dollars, piled up a long list of expensive equipment, including $0.15 million for a Xeon MP 7000 4CPU 8 core server, $1 million plus for storage with FiberChannel 2Gbps HDDs, and got a TPC-C database transaction score of 221,017. The IBM system won't be available until March 31, 2006, a day before April fool's day. In the meantime, IBM folks are probably busy working to fit a huge heatsink to cool the 4 Xeon 7040 MPs. At 2.66GHZ, these monsters produce 173 watts each. Four of them make 786 watts for CPUs alone, considering power conversion efficiency, the 4 way INTEL server is like a 1200 watt microwave oven running all day, 24x7x365. See page 68 of INTEL's design spec. At $0.18/kw-hr, these 4 Xeons cost 0.18 * 24 * 365 * 1200/1000 = $1892 per year on energy bills. In comparion, the duel core Opteron 870 HE is only 55 watts. HP on the other hand, spent $0.48 million, including $0.37 million for an Opteron server and some cheap storage all together, and got a TPC-C score of 202,551. The HP system is available on November 8th, 2005. TPC-C is a database transaction benchmark, and faster hard drives is a deciding factor for performance. The fact that IBM threw $1 million onto the storage but only got a tiny improvement on score indicates that the Xeon CPUs are the bottlenecks -- their raw speed is only 60% of AMD. My suggestion for IT buyers is to spend $0.48 million to get the HP system and enjoy 4 more months of performance, and save the $1.40 million for Christmas bonus. Then you make millions using the HP system, the fastest available. By the time IBM's $1.8 million Xeon system is available 4 months later, HP will have an even faster system at the same $0.48 million price.